Most “dirty words” are four letters. Except one, at least to Salt Lakers: inversion. In an inversion, a dense layer of cold air is “stuck” under a layer of warm air. This warm layer acts like a lid, trapping cold air near the valley floor. This reversal of typical winter conditions (warm air in valley and colder air at higher elevations) causes a double whammy of bad news. First, high pressure means it’s not snowing in the mountains. For powderhounds, this is a bummer, though skiing groomers under blue skies in 40ºF temps is quite the solace! 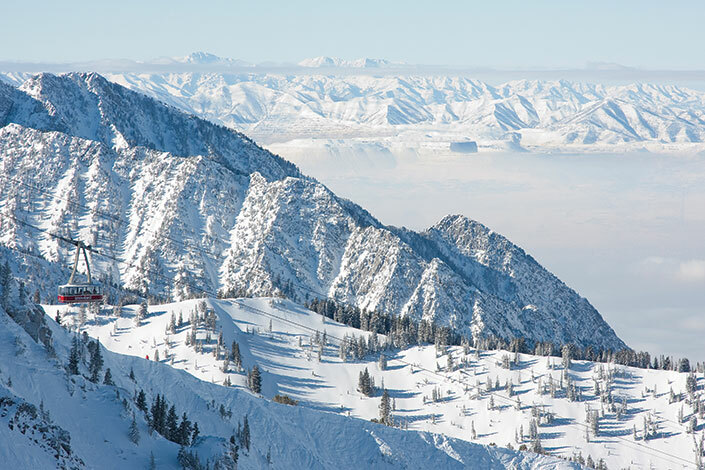 Second, colder air is trapped in valleys, such as the Salt Lake Valley, under the “lid” of an inversion. Auto exhaust, refinery emissions, and worse are trapped in this air, as the pollution cannot escape. Thankfully, we can. The quickest escape is heading to higher ground in the Wasatch Mountains. Whether it be skiing or snowboarding at a local resort or cross-country skiing and snowshoeing trails in the Cottonwood Canyons or Park City, you can breathe clean air just by increasing your elevation a few thousand feet. And you don’t even need to turn your engine on and add to the inversion to get there. Take TRAX (or a local bus) to one of several ski bus routes operated by UTA that originate downtown, in Midvale, or Sandy to access to Cottonwoods. There’s ample space for your skis, snowboards or snowshoes aboard, and you can check email or social media on your way up the canyon. For Park City, the PC-SLC Connect bus, also operated by UTA, heads up Parley’s Canyon with stops at Canyons Village, Park City Resort, and Deer Valley. Keep in mind it’s an early start to catch this ride—the last bus departs before 7 a.m. If you want to leave an inefficient or 2WD vehicle at home, new this year is UberSki, which offers rides in vehicles with ski racks to the all four Cottonwood ski areas, as well as Park City and Ogden resorts. If it’s snowing and you don’t have a 4WD vehicle, this is your ride to the hill. 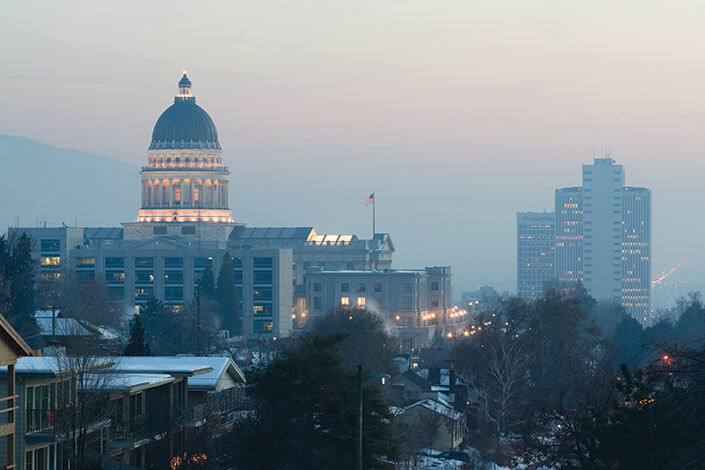 Downtown Salt Lake City during an inversion. It may seem counter-productive, but inversion season is a great time for a road trip, provided you carpool and minimize adding emissions to already distasteful air. Team up with friends or couples and hit the road to explore resorts you don’t routinely visit: rent a cabin in the Huntsville area to explore Powder Mountain and Snowbasin or head south to Eagle Point on Brian Head and rent a large slopeside home. Logistically, it helps to have a friend with a vehicle with a roof box. We’ve fit 10 people in two vehicles: a Prius that comfortably holds four adults, and another six friends in an SUV outfitted with a roof box for ski gear. While it’s not a net-zero carbon emission trip, the footprint is fairly low. If the temperatures at Wasatch ski resorts are in the 40s and 50s, there’s a good chance the mercury is climbing past 60°F in the St. George area. Now is a great time to get the mountain and road bikes back out, knock off some winter dust, and hit the trails. If biking isn’t your thing, the golf courses stay open year-round in Utah’s Dixie. Be forewarned temps can dip at night, and the sun sets quite early, so camping can be dark and cold. One advantage to the St. George area is a plethora of affordable motels. I’ve been known to perfect the art of “motel camping” on a few late winter trips down south and grill burgers on our tailgate just steps from running water and a comfortable bed. Should St. George be a bit too chilly or muddy for mountain biking, try the biking trails in the Vegas area, as well as world-class climbing at Red Rocks. You’ll return ready for some fresh powder, but already looking forward to the spring months just around the corner.